Midwest Writers Workshop celebrates National Poetry Month with a poetry reading on Wednesday, April 6th, 7:30 p.m. at Vera Mae‘s Bistro in downtown Muncie, IN. All are welcome and the event is free. David Shumate is the author of Kimonos in the Closet, The Floating Bridge and High Water Mark, winner of the 2003 Agnes Lynch Starrett Poetry Prize. His poetry has appeared widely in literary journals and has been anthologized in Good Poems for Hard Times, The Best American Poetry, and The Writer’s Almanac. 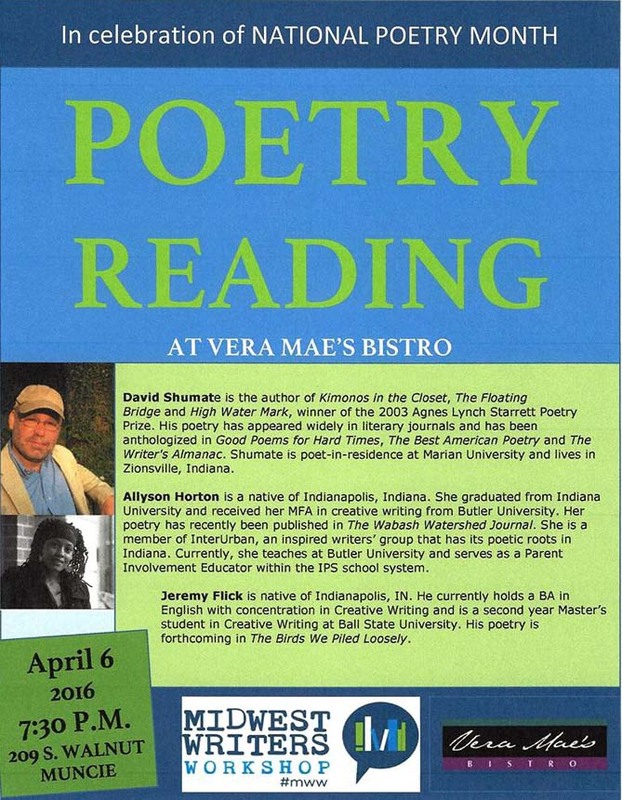 Shumate is poet-in-residence at Marian University and lives in Zionsville, Indiana. Allyson Horton is a native of Indianapolis, Indiana. She graduated from Indiana University and received her MFA in creative writing from Butler University. Her poetry has recently been published in The Wabash Watershed Journal. She is a member of InterUrban, an inspired writers’ group that has its poetic roots in Indiana. Currently, she teaches at Butler University and serves as a Parent Involvement Educator within the IPS school system. Jeremy Flick is native of Indianapolis, Indiana. He currently holds a BA in English with concentration in Creative Writing and is a second year Master’s student in Creative Writing at Ball State University. His poetry is forthcoming in The Birds We Piled Loosely.